So I was tweaking on the timing tables on my Express with the L31 and noticed that no matter what, it will not run over 34.5* advance. I looked High/Low octane/MBT timing tables and all applicable retard tables and see no reason it should not reach the 42* I have commanded. My guess is that it is an undefined constant not in HP Tuners software. 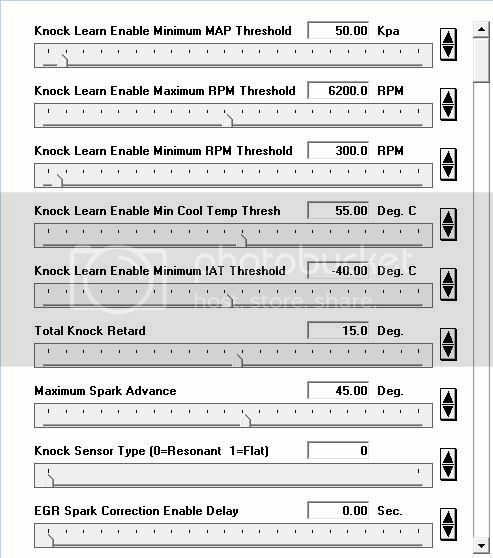 Anyone have luck getting over 34.5* of timing at cruise out of an Express L31 based tune? I was tuning a 4.8 truck the other night and it was running 52-56* of timing STOCK in places going down the highway and from prior experience my other vortec liked 42-46* of timing at cruising speeds. The tight LSA cam I am running has alot of self EGR at low loads and engine speeds and likes the timing. For reference we are talking about the 2,000-3,500 rpm range between 30 and 50 kpa. Last edited by Fast355; 09-17-2013 at 04:08 PM. With the L31 Vortec your kind of stuck with limitations of distributor at 45* Which is not an issue with 4.8,5.3 COP systems. Why you can only get 34.5 in that are looks to be a "Mean Best Timing Spark Advance" Setting? Values are set at 45° in that area on that table, 45° in the High and Low octane tables. IAT/CTS compensations are -2° and there is zero active knock retard and I always disable burst knock. Thanks for the graphic. I am running th 2002 operating system with a 1500 calibration and I am thinking it may be different. Last edited by Fast355; 09-17-2013 at 06:45 PM. Here are the values and ranges I am operating in cruising on flat land. I remember something Ed Wright posted about timing limits on 4.3L. Never heard of HVS before. Its also definately a 5.7 calibration. The 4.3 can take more advance because the spacing is wider. Oh that makes sense, just never heard it refered to as that is all. I noticed after emailing HP Tuners about this the other day that the constant had been added to the timing advance tab for maximum advance. It was set at 45° so I bumped it to 55° and now cruise at the 42° of timing I have commanded in low load areas. Running much better now. $42 adding spark advance to Data Stream?